Fenella Bowden & the HBI team remain appalled by the lack of security around the derelict site alongside Phoenix Way & Caerphilly Road. In spite of recent, and poor, attempts to secure the site, access routes can clearly be seen. This has been a long-standing problem for residents in Birchgrove, who are witnessing anti-social behaviour at this location on a daily basis. Reports of entry to the site by youngsters as young as 9 or 10yrs old is a huge concern as the sites are unsafe. This site is a PACT priority for Birchgrove. What would you like to see in Heath Park? 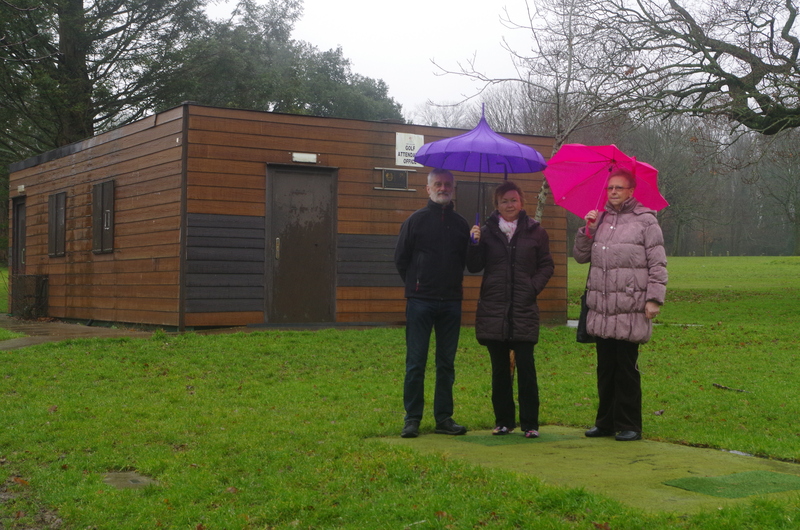 Fenella, Steve, and Jane want to hear from residents about what they would like to see in Heath Park. Jane Reece added ‘Other parks in the city are receiving investment, and we think that Heath Park is getting left behind. There is very little to entertain young people here at the moment’. Fenella commented ‘We have already had some very interesting suggestions and I am following these up with Parks Department to see if they could be accommodated. We are very aware of the budget constraints but we do think that there is capacity for sponsorship or grant funding for our park’. Bus Lane solutions bring no relief. Cllr Fenella Bowden & the HBI team are worried about the increased congestion in the Ward arising from traffic using Caerphilly Road, Manor Way & local side roads to access the city & UHW. Fenella said ‘We have always said that a Park & Ride facility in Cardiff North was essential to reduce traffic using these roads. But there is no provision for one in the LDP. The rolling out of the Metro which may see a P&R developed in Taffs Well is a long way off, meanwhile more housing developments on the green belt & in Caerphilly will mean an increase in traffic using our Ward. Fenella will be asking the Council to undertake pollution tests on each of these roads and has asked the Council to do traffic surveys on parallel roads which are seeing a big increase in traffic volume to avoid bus lanes & queues. The New Inn on Caerphilly Road is due to open to the public on February 9th amidst remaining residents’ concerns about the outdoor space, noise, and parking. Residents have asked Cardiff Council to review the license of the New Inn to prohibit drinking outside the pub. This comes after years of bitter experience with the New Inn and its associated anti-social behaviour. Fenella said ‘This is a particularly sensitive issue for residents who live so close to the New Inn. While they recognise that the pub has been refurbished, and that the management has changed, there is a long way to go before residents can feel reassured. Steve added ‘For many local people the re-opening of the New Inn will be welcomed as it brings choice to Birchgrove, and we understand that, but the consequences for those living nearby is what has to be considered too’. We’re getting the railings back! Fenella & the HBI team are delighted that Cardiff Council is to re-instate the railings at the corner of Birchgrove Rd & Caerphilly Road to protect the safety of children & pedestrians on this narrow pavement. These railings were removed during the Birchgrove Shopping District regeneration project but have not been returned. Council officers have stated previously that there was no need for them but parents/carers of children who attend Birchgrove School thought otherwise. A huge thank you to residents for supporting our campaign! Now for the 20mph zone! !